Many times I run into people with back issues and they will ask me, or tell me, about "Core Exercises." Like this is THE ONE thing they need to do to solve their back issues. Even though having "weak" core muscles can be part of the equation, it is a very incomplete picture. Core means center, the innermost part. When it comes to the human body, the core is the spinal column. The spinal column has a NORMAL configuration or alignment. Do you know yours? If you look at it from the front or back, it should be straight and vertical. Looking at a normal spine from the side, you will see "S" shaped curves. Researchers have even figured out what the normal radius of those curves should be. 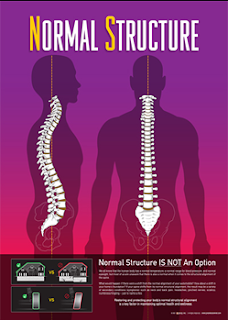 So just like measuring normal blood pressure, normal eye sight, normal temperature, etc..., we can measure normal structure of the spine with proper structural x-rays. This is vital in figuring out if you have ABNORMAL shifts or deviations that can be causing Secondary Conditions (Symptoms). Again, those are commonly Secondary Conditions (symptoms) that are a result of a Primary issue (poor structure). So, getting back to your core exercises. Let's focus on the lower back for a minute. If you have suffered with lower back pain, I'm sure you have gotten all sorts of advice from family, friends, trainers, therapists, and doctors as to "The Solution". Kind of like getting rid of the hiccups; everyone has their favorite way. I'm not here to tell you they are all wrong, just that back pain is a Secondary Condition to some other primary issue that is going on. If we keep this conversation to just the musculoskeletal system in nature, then wouldn't it make sense to know what your core structure (spine) looks like before a prescribed treatment is given? Just looking at your posture is NOT going to definitively tell us what's going on inside. Let me use another example. Let's say your front right tire has some abnormal wear and tear on it & you bring it to the shop where they rotate the tires. A few months go by and the right front tire now has the same wear and tear as the previous right front tire. So you bring the car back and have the tires rotated again. You keep doing this until it's time for new tires. You notice that these tires did not last as long as they should have, so you buy some better tires and low and behold the front right tire starts that same abnormal wear pattern. This time you go to a different tire shop and the first thing they ask you is "have you had your tires aligned?" The ding, ding, ding bell goes off in your head. Performing core muscular exercises with a spine that does not have normal structural alignment is like rotating tires on a car without aligning the front end. You might have some temporary improvements with your secondary conditions, but your body is still less efficient with energy, movement, and strength. This sets your body up for more injuries. Take that one step further and realize an out of aligned spine will wear out faster than one that is properly aligned. The laws of physics and gravity will see to that. Hopefully you're starting to see that even exercises for your core muscles could be harming your core structure! At Moore Family Chiropractic we do a complete structural exam on each patient to determine there structural status. This includes a complete set of Structural x-rays in a weight bearing position with proper set up as to not get a faulty picture. We perform a digital foot analysis to determine the status of the feet and how they are supporting everything above it. A digital postural analysis is done and compared to the inside structure as well as determine the outside degree of shifts and deviations from normal. Functional tests are also included on the structure and nervous system to determine how your body is responding to its current state. This exam gives us a very thorough picture of your structural status and then we are able to give you a treatment plan to best help you. And you know what, you might even receive some core structural care. It all starts with a complementary consultation, which is a conversation not a commitment. Which Part Sunk The Titanic?